View of Margate Piers and the Two Sisters. 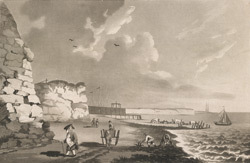 Margate in the late eighteenth century became a resort for wealthy invalids. Persons of fashion came to follow the new trend for sea-bathing in order to restore their health. In this view bathing machines can be seen in the sea. Margate Pier was rebuilt in 1789 but later damaged by a storm. The harbour was not really developed until it was built by John Rennie in 1810. The artist is John Watts (1770-) a landscape painter who lived in London. The engraver is Francis Jukes (1745-1812).